Pernell-Karl Sylvester “P.K.” Subban is a Canadian-born professional ice hockey defenceman for the Nashville (Tennessee) Predators of the National Hockey League (NHL). Subban was born on May 13, 1989, in Toronto, Ontario, Canada to Karl and Maria Subban. Subban also has four other siblings: two sisters Nastassia and Natasha, and two brothers Malcolm and Jordan. Subban started playing hockey as a pre-teen and continued into his teens when he attended Runnymede Collegiate Institute located in Toronto. After graduation Subban began playing professionally, joining the Belleville Bulls (now Hamilton Bulldogs), the junior ice hockey team based in Belleville, Ontario, Canada which was part of the Ontario Hockey League (OHL). Subban was drafted by the Montreal Canadiens in the 2007 NHL Entry Draft (at age 18) but wouldn’t start his career with the team until 2009. Subban continued to play with the Belleville Bulls where he would help them to the J. Ross Robertson Cup Finals against the Kitchener Rangers. The Belleville team lost the OHL title in seven games. 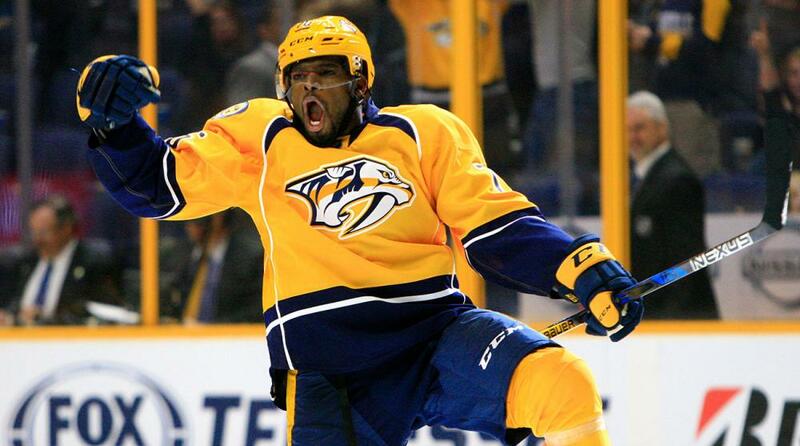 Subban finished his four-year junior career with 76 points in 56 games in the 2008-09 regular season. In May 2009, Subban was signed to a three-year, entry-level contract by the Montreal Canadiens. He began the 2009-10 season with the Hamilton Bulldogs, Montreal’s American Hockey League (AHL) affiliate. Later that season, he was selected to play in the 2010 AHL All-Star game in Portland, Maine. On February 11, 2010, he earned a call-up from the Montreal Canadiens. The following day, he registered his career NHL point, an assist, in his debut against the Philadelphia (Pennsylvania) Flyers. During Subban’s career with the Canadiens, he was awarded the James Norris Memorial Trophy as the NHL’s defenceman of the year, edging out Kris Letang and Ryan Suter for the honor during the 2012-13 NHL. That same season, Subban was named to the NHL First All-Star Team. On January 7, 2014, Subban was named to Canada’s 2014 Winter Olympic team to participate in the games that were held in Sochi, Russia. Subban and the Canadian team won a gold medal when they beat Sweden in the tournament final. Subban remained with the Montreal Canadiens until 2016 when he was traded to the Nashville Predators in exchange for defenceman Shea Weber. During the 2016-2017 NHL season, Subban and the Nashville Predators made history as they advanced to the Stanley Cup Final for the first time in the franchise’s 19 year history after defeating the Chicago (Illinois) Blackhawks, St. Louis (Missouri) Blues, and Anaheim (California) Ducks to face the Pittsburgh Penguins. Subban is known for his philanthropy and charitable work. On September 16, 2015, Subban donated 10 million dollars to the Montreal Children’s Hospital which at the time was the single biggest philanthropy commitment by a sports figure in Canadian history. In 2017, Subban was awarded the Meritorious Service Cross (Civil Division) in recognition of his various contributions to Canadian society. Subban is single and has no children. “P.K Subban,” P.K Subban, http://www.pksubban.com/life/; “P.K Subban,” Hockey reference, http://www.hockey-reference.com/players/s/subbapk01.html; “P.K/ Subban,” National Hockey League, https://www.nhl.com/player/p-k-subban-8474056.